Love chalkboards? 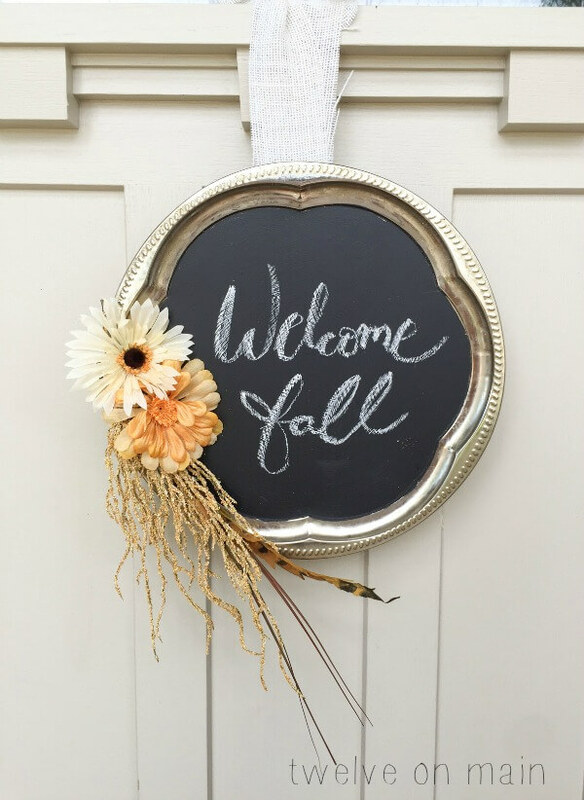 Why not make one of these easy upcycled chalkboard wreath for fall or for anytime of year! Its so versatile and easy to customize! I’m just going to warn you now. I am going to be posting quite a few fall posts, and for the next little while, you may be inundated with fall style wreaths. I’m having a bit of a moment here. I may have to look into a support group. This wreath was a really easy and fun project. It literally took me less than an hour, and that included the chalkboard paint drying time. 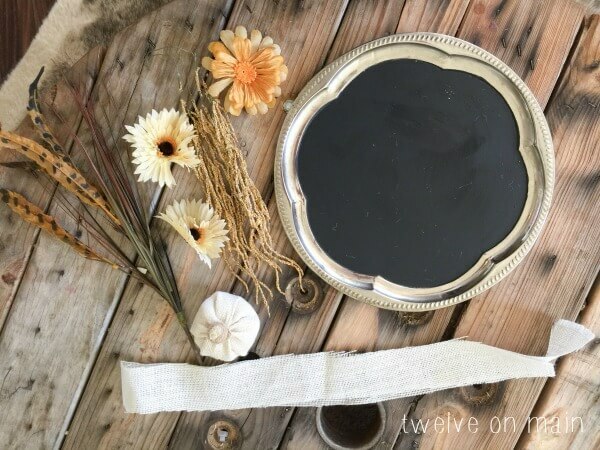 Have you ever been to a thrift store and seen those silver trays they sell for a buck a piece? This is where I came across this one specifically. It was a really easy transformation. Check it out. The first step was to paint the chalkboard onto the tray. This tray had a nice scalloped feature. 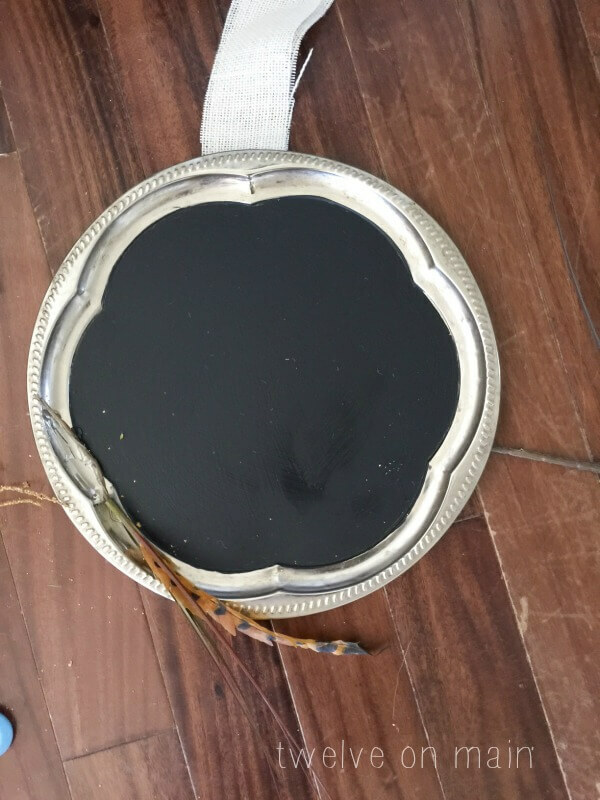 I then used the hot glue gun to glue a piece of burlap ribbon to the back of the tray. Once it was painted and dry, I started to apply a few floral and feather pieces with the glue gun as well. The next step was to add a few flowers to the top to balance it out. I wanted to keep the wreath simple with just a few adornments. I would say that even adding these was quite a stretch for myself. You could add more or less depending on what you like. The last step was to write a little message on the chalkboard. 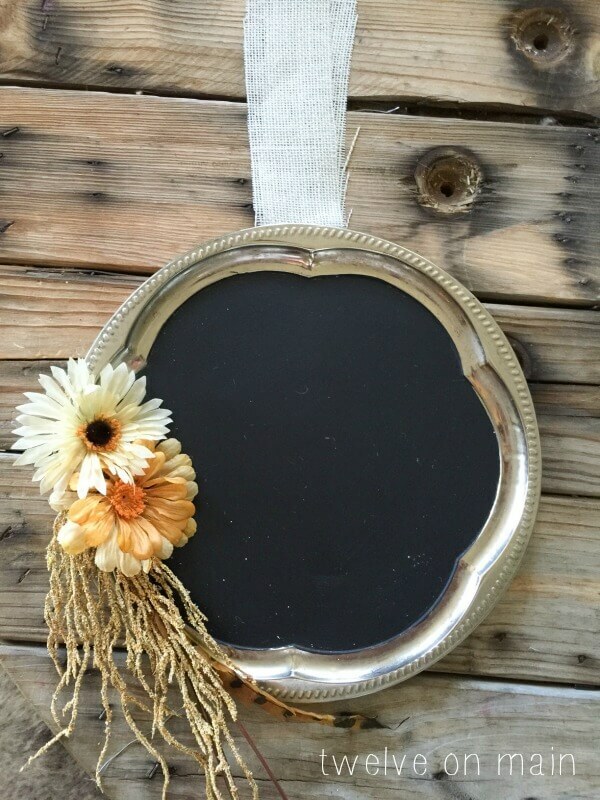 I love the simplicity of this chalkboard wreath. 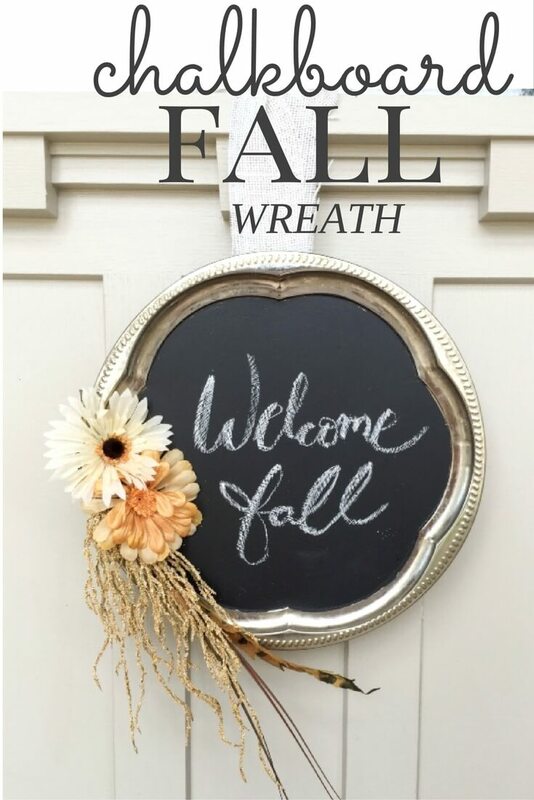 It is a fresh take on the whole fall wreath idea. Try it out! It would look great hanging inside your home as well. Its a very versatile style of fall decor. Its funny, I didn’t realize it at the time I was making it, but this wreath cost me a total of about 4.00! 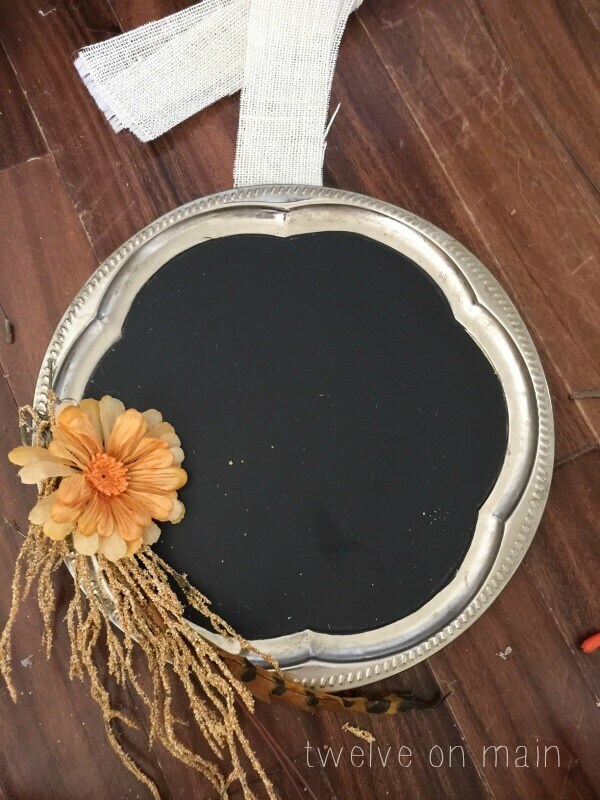 I got all the flower accessories at the dollar store, the platter was 1.00 at a thrift store, and the chalkboard paint, I already had. I love it when a project comes together so easily and so inexpensive! So what do you think? 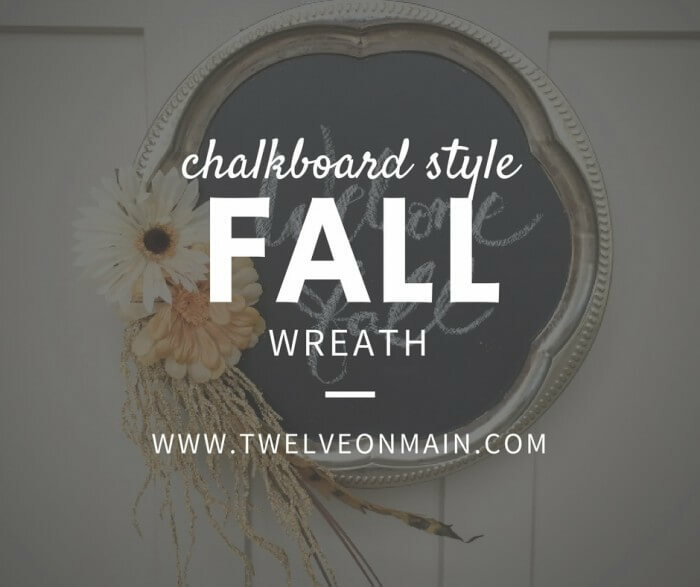 Could you use a chalkboard as a wreath? Are you looking for some more fall inspiration? If you don’t want to DIY a wreath, check these awesome ones out! « DIY Velvet Pumpkins In No Less Than 10 Minutes! I LOVE your “wreath”! 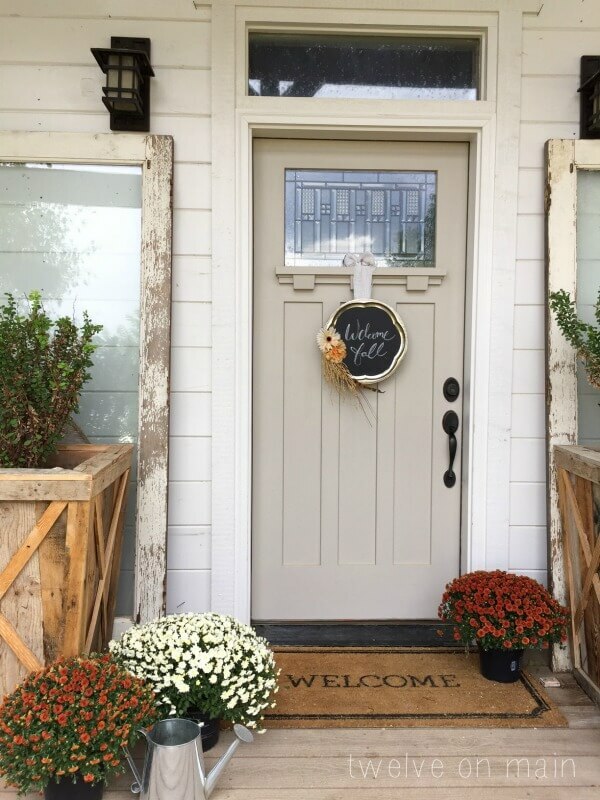 I’m all about door decorations that look a little different than traditional wreaths, and this one is just perfect for fall!! 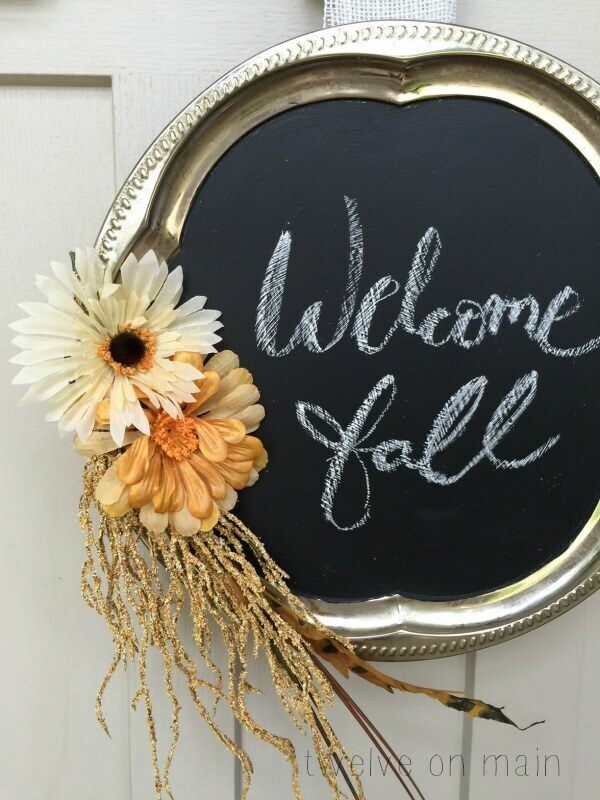 Just signed up for a fall wreath class at Michaels! I love frugal crafts and this one came out great! This is SO adorable AND easy – love it! Thanks for sharing it at Talk of the Town. I’ll be featuring it this week, and pinned it to the Knick of Time Talk of the Town part board! 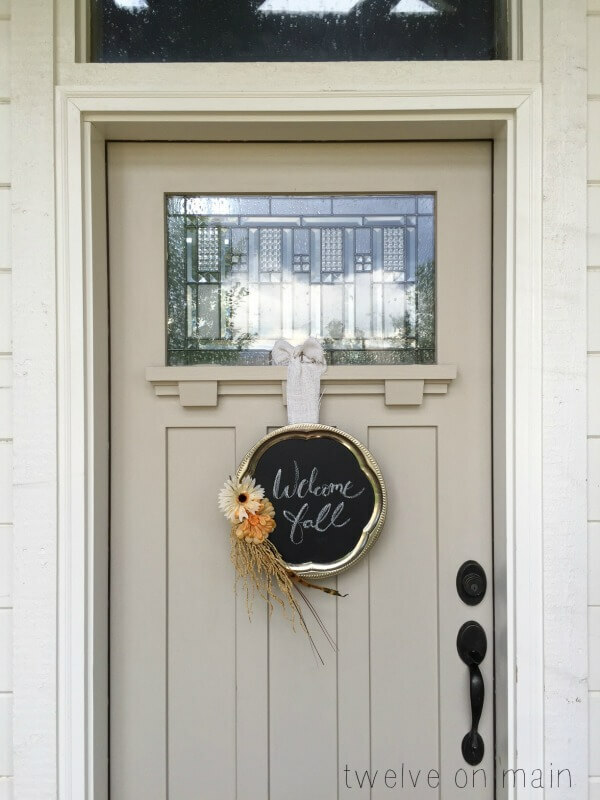 Your chalkboard wreath is so cute and original. 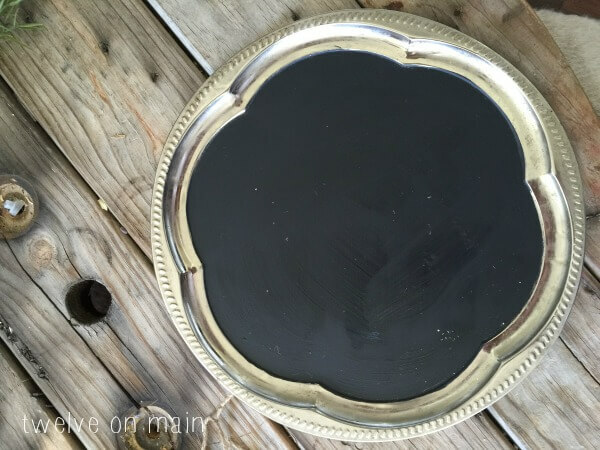 I love inexpensive projects, especially ones that are made with thrifty finds. Thanks for sharing! Pinning!